There is now lots of great Symfony 2 documentation around on the web. Below we will discuss some of the key areas to learn about Symfony 2 for beginners and intermediates. It’s always good to check out the Symfony 2 book for starters. This is the official Symfony 2 documentation. What’s nice about the book is the way that it is broken up into digestible chapters. It summarises what’s coming up in each chapter, as well as after what you’ve learned to help your understanding. The authors at Sensio Labs welcome feedback, amendments and comments on their Symfony 2 documentation. The Symfony community also offer help and support to produce the most useful documentation. Fabien Potencier was the original author and still contributes extensively (as far as I know). You can find further Symfony 2 documentation at the GitHub page. GitHub is a codesharing and publishing website. Essentially it’s social networking for programmers. The essence of GitHub is Git itself. This is an open source project that was begun by the creator of Linux, Linus Torvalds. Git is a version control system that manages and stores the revisions of projects. It is mostly used for code, but it could be used for any type of file. You could call it a filing system for draft documents. GitHub is so useful because it encourages the granular recording of any changes. That means that beginner or expert programmers can follow the steps of some of the best developers in the world, and see how they solved tough problems. The Symfony 2 documentation within GitHub includes best practices, bundles and components, amongst lots of other bits and pieces. Documentation offered by users is encouraged. But it must fit into the set standard that is found on the Symfony website. This includes the correct format, standards, translations, and creative commons licensing. You can read the Symfony 2 official cookbook. This is a ton of practical guided how-tos on specific recipes. It helps you solve the most frequently experienced problems that Symfony developers come across in their every day world. The cookbook is a growing collection and is added to regularly. Like the Symfony 2 book, this Symfony 2 documentation is also available on the website and can be downloaded as a complete PDF. How to customise error pages. How to force routes to always use HTTPS instead of HTTP. How to customise form rendering. How to build a custom validation constraint. How to test doctrine respositories. How to inject variables into all templates. I won’t include them all because the list of covered topics is extensive. It’s a really valuable resource for any learner. You can see all of the topics here. There are a couple of Symfony books that you can get on Kindle or Paperback. I can’t recommend any specific one so go off some of the reviews if you like to learn from books. What about putting all of this Symfony 2 documentation into practice? Seeing things happen on camera and following along as you code is when things really fall into place. 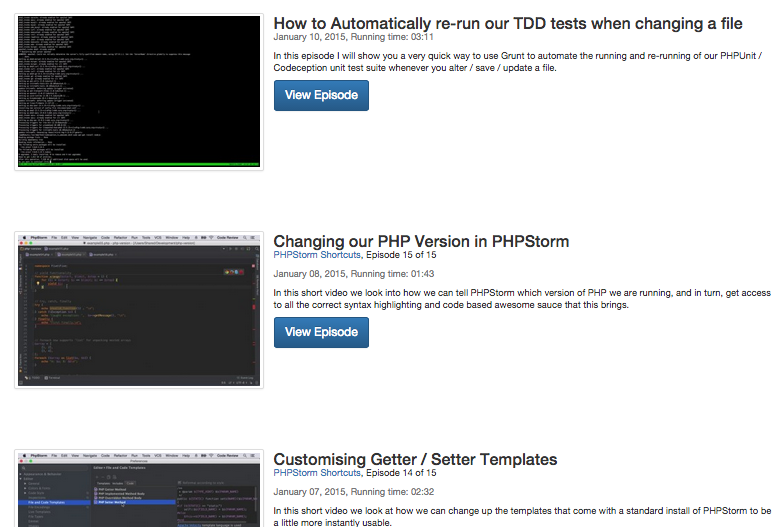 You can watch our free and members only Symfony 2 tutorials at Code Review and put what you’re learning into action!